Digital Extremes is celebrating the holiday season with a lot of giving. 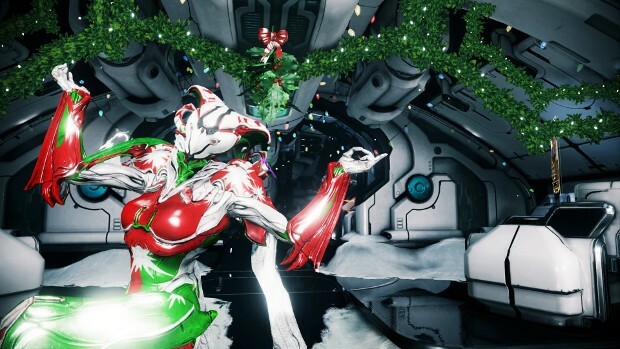 The annual Tennobaum celebration has kicked off, allowing players to gift each other while raising money for the Boys and Girls Club of London. Warframe players gift each other items in game between now and January 4, 2017. These gifts will be tracked in the Warframe Gift-O-Meter and when players hit specific gift-giving goals they will earn rewards for themselves and donations for the kids. There are 5 goals on the Gift-O-Meter, with the last goal being undisclosed at the moment. That said, players have already given over 50,000 gifts and raised $10,000 for the Boys and Girls Club — as well as earning two spiffy rewards for themselves. If you’d like to keep track of the Tennobaum goals, you can find the meter, as well as a gift giving leader board on the Warframe site. I should mention that in the first day, the warframe community shattered the first couple milestones, and Digital Extremes decided to give away twice as much. For instance the milestone that would’ve gotten 10,000 for the boys n girls club is now 20,000 for the kids. Its awesome. This seems like an awesome idea. I’m glad some MMOs do huge events like this. At least I’ll not be participating sadly since I don’t play this game but hopefully the boys and girls club of london reach their goal by the deadline. I salute MMOs who go out of their way to make huge charity events like this. I know one MMO who makes a event like this for fun yearly but doesn’t donate or raise money they just do it to raise the movement of sharing and the top rewards are a personal item from a staff members account. Since the game is pretty much dead with less then 300 players daily and the community being toxic and so many glitches you got to deal with and with the death of adobe flash player it’s just not worth it. This dude is high, there are 45,000 players online at any given time and that is only on Steam. Game is NOT dead at all. Community is fine. Idk what this kid is trying to gain by talking crap about a very alive and very fun game. I apologize if you mistook what I said I was talking about another MMO that was a 2d browser game that had a dying community that had a similar concept of what warframe was doing. I know warframe has a decent/good playerbase I may not play this game but I know this is a good game I’d recommand it but I wouldn’t personally play it myself. The game I was browser game I was also talking about which was off topic isn’t on steam and runs off of adobe flash player but I apologize if you are offended by what I posted. I was only commenting about a game I knew since warframe was doing this event and I wasn’t bashing warframe I know warframe is a good game and has a steam community and a good playerbase and friendly players. But yeah I apologized for not making it clear but the game I claimed was dead isn’t warframe it was some trash browser game called epicduel. Please don’t comment and insult me without reading the entire posts I made. I also spoke about warframe and made some positive comments about it. You obviously ignored them and only wanna talk about the adobe flash player comment which was a bit off topic I know but it you read all what I wrote above then you would know what I was talking about.